First week back of term is not really the ideal week for training to go up to another level but it is what it is and there’s not much I can do about it. So I just got on with what the training plan told me. Be ready for a long post – it was a loooooong training week. On Tuesday, I set my alarm for 5.45am, got up and ran around my neighbourhood. I am not at all an early morning runner, as much as I’d like to be. The thing that got me up was knowing husband and I had movie tickets that night that would give me no chance to run after work so it was early or not at all. So early it was. I’m pleased to say I actually enjoyed it. Now that it’s getting light earlier, I didn’t need my head torch and was treated to the soft, welcoming colours of dawn as the neighbourhood woke up. And I got to bask in that ‘I’ve already done my run’ kind of feeling all day. Tick. Tuesday night, husband and I did go to the movies but not ordinary movies – it was the Run Nation Film Festival in Melbourne and we had won tickets thanks to a parkrun competition. I think it deserves a blog post of its own but, in summary, it was brilliant. The films chosen were a perfect mix and provided exactly the inspiration I needed this week. Thursday afternoon ended up being a hill day as my friend and I headed out to the You Yangs for our regular trek up the Saddle. I’d been getting a bit paranoid about my leg which had been doing what it does – flare up for no reason when I have an event coming up. However it was perfectly ok after the hills so which reassured me that it was all in my head. Saturday called for 11km which meant parkrun plus some extra. We were going to Bannockburn Bush parkrun launch so we went out early and ran the course (and a bit) before the others got there. It was actually really, really lovely. It’s a very peaceful place and the fog added to the atmosphere. We took it easy, aiming for a pace that would keep us a bit ahead of the balloon ladies and achieved this without a problem. Completing parkrun afterwards was also very low stress and I had no soreness at the end as we tucked into breakfast. I did take it easy for the rest of Saturday – not sore, just a bit tired and knew we had an early morning this morning. Today was our long run – 27km on the training plan which suited us as we’d signed up for the Melbourne half marathon. 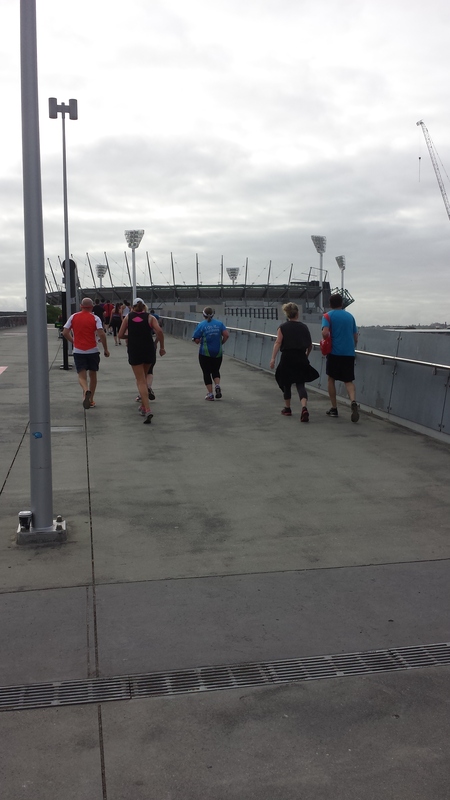 We arrived early, dropped off our bags and then set off on some laps around the MCG to add on some extra kilometres. I think the people arriving for their events thought we were possibly a little insane but it was actually quite enjoyable. We then joined everyone else at the start line and were off, leaving our Garmins running to track our longest long runs yet. I ran with a friend for quite a while and really, really appreciated having her there – I am sure I wouldn’t have had as much ‘run’ in me without her. It’s funny how, even without pushing you or telling you you have to, having someone there makes you instantly more accountable. You don’t want to let them down. And so it was today which was exactly what I needed. The first part of the run went off pretty well and the kilometres flew. It certainly helped that we were surrounded by people all buzzing with event excitement and had glorious blue skies. Albert Park lake, the site last year of wind and bugs, was stunning today and my regular check-ins with my body confirmed that nothing was hurting. The only thing that was starting to get to me was that I was tired but that’s to be expected – a big part of this training plan is learning to run on tired legs. Once we were back on St Kilda Road and felt like we were on the home stretch, I found it harder to keep up the intervals and set my friend free – time to knuckle down and just get on with our own journeys. My mantra today was ‘This is hard, yes but not impossible’ and that was enough to keep me going. Clearly the fatigue and endorphins combined to leave me prone to random tearing up – cheers on the course from a parent of one of my students (who was running the marathon) made me teary as did hearing the cheers in the final stretch. I took a big gulp and entered the MCG. Last year, I remember finding I had to dig deep to keep running as I had run a PB and had nothing left. This year was very different – I was certainly tired but my legs and lungs were still well and truly strong enough to get me there. 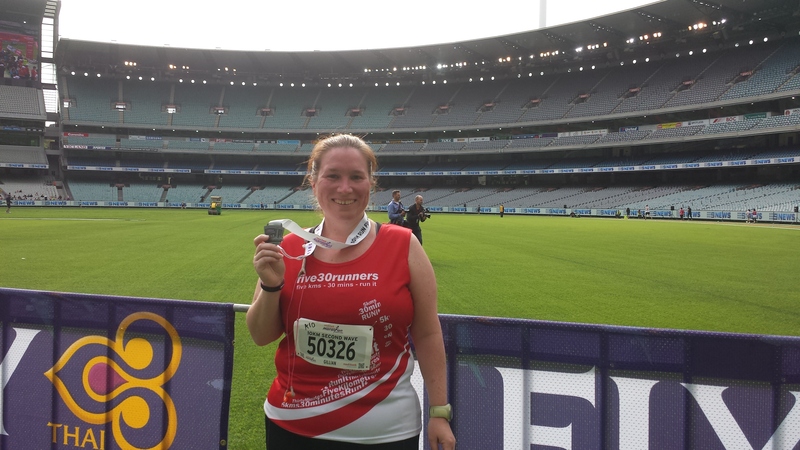 However crossing the line wasn’t enough – I still had another 1.5km to go to reach my training plan distance so I got my medal, headed up the steps and found another friend who kindly offered to collect and carry my bag and do a couple of laps of the MCG with me to finish. 27km – done. 48.7km run this week – my biggest training week ever. Will see how I am tomorrow but, for tonight, I feel great.